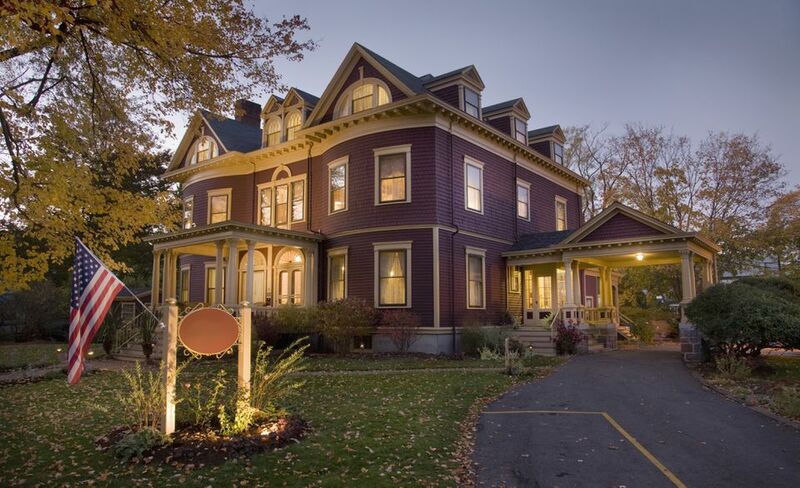 Maine's coastal areas aren't the best places to see fall foliage, but this lovely Victorian Inn in Rockland is still a great choice in the fall. Why? The inn's rates are affordable (especially after mid-October), and with free homemade pie each evening, you won't be able to wait to return here after a day of scenic inland driving. The Bethel Inn is located on the village common in Bethel, Maine, one of the state's best home bases for foliage seekers. It's your choice for fine lodging and resort activities, including golf, tennis, and swimming (the outdoor pool is heated year-round). The Birches Resort on Moosehead Lake in Rockwood, Maine, is a pretty place to unwind and watch the leaves change. Stay in one of the resort's cozy log cabins, toast marshmallows beside your own campfire at night, go on a moose cruise or a paddle around the picturesque lake, and explore some of Maine's best foliage-lined drives from this northern outpost. For a true New England experience, stay at the Harraseeket Inn during fall foliage season. Conveniently located in Freeport, Maine, just two blocks from the L.L. Bean flagship store, this antique-filled inn has 23 fireplaces, two distinctive restaurants, and an indoor pool. Even if the fall foliage doesn't cooperate, you'll have a memorable getaway. The Lodge at Moosehead Lake offers nine thematically decorated rooms and suites complete with Jacuzzis for two and fireplaces. You'll find leaf peeping opportunities galore in the remote and pristine Moosehead Lake region, but you won't sacrifice a thing when it comes to comfort and luxury when you book a stay at this award-winning boutique inn. In South Casco, Maine, this lake-side, bustling family resort in the summer becomes a quiet retreat in the fall where adults can relax and enjoy Maine foliage. Choose one of 35 private, peaceful cabins at Sebago Lake, surrounded by 125 acres of forest. Countless activities include fishing and kayaking, or treat yourself to a massage. Fall is considerably more affordable than a summer stay here. Formerly an MBNA corporate retreat, this getaway near Camden, Maine, was reinvented in 2009 as a luxury cabin resort. You'll be surrounded by 379 acres of lush autumn foliage and enjoy extensive recreational opportunities--from sea kayaking to bowling--when you book a fall stay in a one-, two- or three-bedroom cabin. Each is equipped with a propane fireplace for cozy evenings at the end of a day of autumn exploring. Located on the shores of Sebago Lake in southern Maine, this 775-acre camping resort offers themed fall weekend getaways, some for families and some for adults only. Stay in one of Point Sebago's vacation homes, park homes, resort cottages or travel trailers, or bring your own travel trailer or RV. The Rangeley Lakes are lovely in the fall, and Rangeley Inn puts you in the heart of it all. This classic inn has welcomed guests for more than 100 years, and since 2013, new owners have invested in upgrades and renovations. Enjoy a gourmet fall escape at Wings Hill Inn in Belgrade Lakes, Maine, where innkeepers Christopher and Tracey Anderson are both Culinary Institute of America graduates. The inn and its restaurant are housed in a 200-year-old farmhouse. Stay in one of Wolf Cove Inn's Maine-themed rooms and gaze out over Tripp Lake, admiring nature's autumn beauty. This romantic and pet-friendly inn offers a number of experiences couples are sure to enjoy. Order a homemade breakfast in bed, or take a picnic outside. Guests give this B&B high marks for decor and the friendliness of the hosts, a married couple. Each of the rooms is decorated differently, incorporating contemporary and vintage furnishings. Most have a four-poster bed. Breakfast offers a choice of continental fare and cooked to order entrées. And fresh fruit and pretzels are available all day. The inn is located in a residential section about a 15 minute walk from downtown.